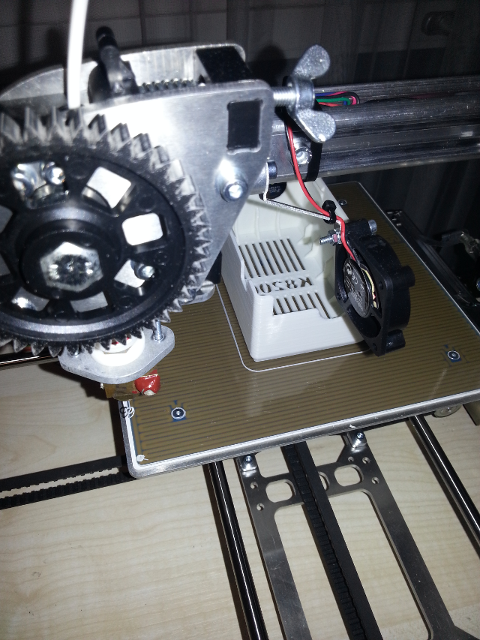 The 3drag printer http://3dprint.elettronicain.it/, https://store.open-electronics.org/3Drag%203D%20printer%20KIT, http://reprap.org/wiki/3drag, https://www.open-electronics.org/3drag-3d-printer/ or Velleman 3D printer kit k8200 http://www.k8200.eu/locale/ is a popular Open Source Printer Platform. Since it is an open project extensions projects as convert it to a CNC machinehttps://www.open-electronics.org/tag/3drag-cnc/ or add on a chocolate extruder existhttps://www.open-electronics.org/3drag-is-now-printing-with-chocolate/. It uses the http://reprap.org/wiki/3Drag_controller https://www.open-electronics.org/a-new-board-for-the-3drag-theres-more-than-sanguinololu/ 3drag controller board following the "Arduino Mega 2560 oder Mega ADK" open source design. A small incompatibility to the Arduino exists. An original Arduino resets each time a communication gets initiated due to the connection to the DTR signal. Since this would stop 3D printing, this line is cut on the 3Drag_controller and fed to a jumper that must be set when a new firmware gets uploaded. The PC software reptier is recommended. The Mega 2560 avr microcontroller uses the marlin firmware from https://github.com/ErikZalm/Marlin. The firmware must be configured for a particular printer (size of table, height, extruder nozzle, filament diameter, temperature sensors, ....). For a beginner it is best to download it from Velleman. The controller board can be expanded with a user interface having a SDcard slot and a Text based LCD. 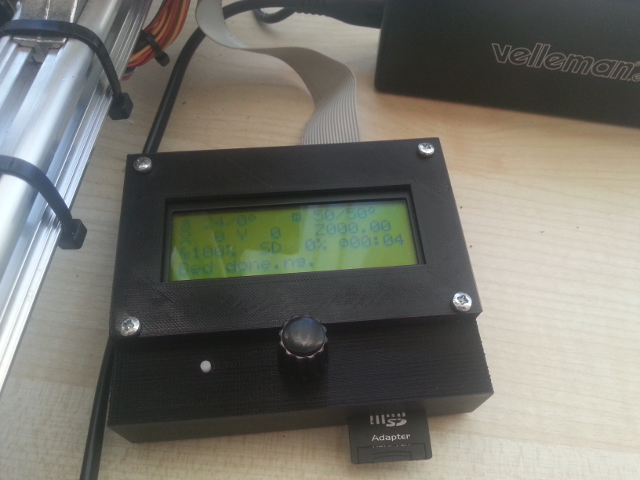 This extension allows then to used the 3D printer autonomously https://www.open-electronics.org/autonomous-printing-with-your-reprap/. Filenames should be short to fit in the display. It prints directly from files containing G-code, those files have a *.gcode or *.g extension. Buying the Velleman K8200 kit gives a very good cost performance ratio. However some skills mechanical, electronics, SW and finally be willing to spend a couple of days to adjust and fine tune it. The kit is not something for people that like to get something out of the box. However not have it out of the box, be open source and very well documented, the printer is a good platform that will not get obsolete quickly. The belts should run rectangular in the frame and have the correct tension. Not to tight and not too loose. When wrong, then a stepper motor could trip and resulting in shift of all following slices. If this still happens the acceleration using the LCD user interface can be reduced as from 1000 to 500. Alternatively the voltage of the stepper driver chip could be increased from 0.425V to maximum 0.55V as Velleman recommends. Or simply recheck if the trimmer voltages are still the same as when adjusted. The X Y bearings holders can have a collision if wrongly mounted. Everything is very well documented except the details about how to mount the NTC resistor of the extruder. However I recommend to use PT1000 resitors instead of the NTC. The bed needs to be adjusted horizontally, so the extruder can move around it with a fix distance. However it might be that the bed is not complete flat. In the middle it might be some 0.1mm higher. The guide says just press it down, but when doing it comes back and bending too much probably could do more damage. The FAQ say the holes where the heated bead is mounted can be increased to 3.5 or 4mm. If it is not extreme than it can be accepted as it is. However it is strongly recommended to put a glass plate onto the bed. Since glass is very stiff it can be assumed that the table will be flat. The countersink screws of the heated bed might stick out and create a potential collision risk with the extruder nozzle, so the holes need to be improved to have something as a 0.1mm. A 15V 6.5A laptop style power supply is used (peak up to 5A can be measure with a multimeter) and needs to be active to be able to communicate with the controller board even when USB is plugged. The USB powers some LEDs and the FTDI USB chip that makes the connection to a PC. The original power supply delivered from Velleman is cheap and might break down. Actually the open source design was done for a 12V power supply, so running with 3V more is not ideal. Stuff as the 12V fan might brake down early and the 5V line regulator on the controller board gets hotter. 12V are too low to heat up the heated bed, this might be the reason why a compromise with 15V has been made. However 15V are still not enough to heat up the heated bead for ABS. For ABS an additional power supply having 24V is recommended. There are some weak points. Being positive, this helps to learn the basics in 3D printing. A complete assembled 3D printer might be easier to set up but when then some problems occur then limited documentation is around. There are many issues known with this printer. Looking positive at it: This printer is used by many innovative and intelligent people that since it is open source steadily improve it. Considering those improvements it becomes an up to date trouble free printer platform. Platform, since it is never finished nor outdated. On the other hand buying a new one and then buying all the updates is not very interesting.